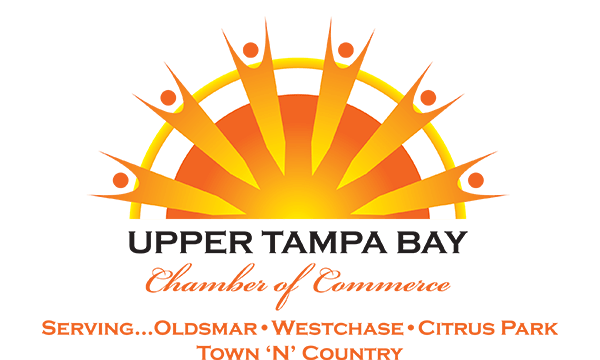 The Upper Tampa Bay Chamber of Commerce is conveniently located across the street from Oldsmar City Hall at 101 State Street West, Oldsmar, FL 34677. A map and driving directions are listed below! Exit Airport heading west on Roosevelt Boulevard. Turn right, heading north over the Bayside Bridge less than 1 mile after leaving airport. Continue north on Mc Mullen-Booth Road approximately 7 miles. Turn right on SR 580. Head east approximately four miles. Turn right on State Street. The chamber is the 2nd building on the right! Exit airport heading south. Take first to the right, heading west toward Clearwater, SR 60. Turn right merging into SR 60, follow directions to Indenpendence Parkway (center-left of highway – between SR 60 West and the Veterans Expressway). Proceed northwest taking left turn on Memorial. Proceed on Memorial about 2 miles and turn left onto Hillsborough Avenue (SR580) heading west. Bear to the left at SR580W/Tampa Rd. split. The first left will be State Street. The Chamber is located in the 2nd building on the right.